Microsoft Edge: A Better Alternative? 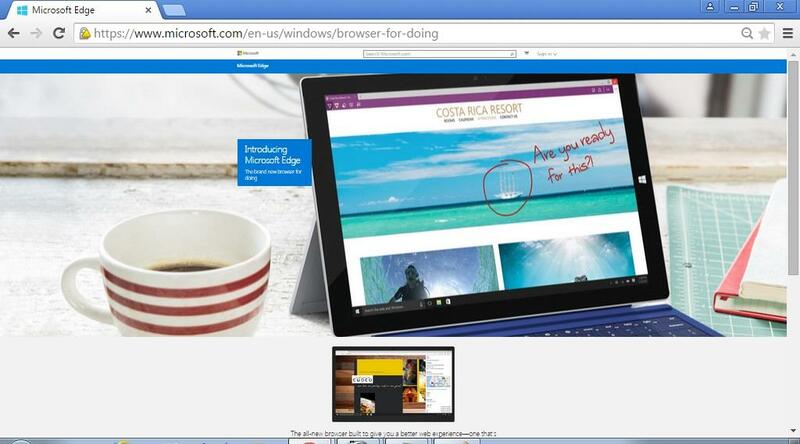 Now Microsoft got their brand new browser replacing Internet Explorer. Keeping in pace with Google Chrome and Mozilla Firefox, it claims to have those features incorporated along with an increasing speed and functionality. Would you consider it as a better alternative? Last few years we have sidelined Internet Explorer with Google Chrome and Mozilla Firefox. Most of us feel them to be more easy to use for browsing, messaging and speeding up the entire process with their striking features. Understanding the necessity, Microsoft too didn't stay back and came up finally with the idea of launching a better browser with a catchy name and attractive features. Working on the replacement of Internet Explorer on Windows 10, Microsoft has been working relentlessly on its next-generation Internet browser project, codenamed Project Spartan, which was due for its release somewhere later this year 2015. They held their developer conference in San Francisco, resulting in the final revelation of the official name Microsoft Edge. This time Microsoft has promised to do a wholesome makeover of Internet browser through Edge, where they have included features like "in-app markup" to highlight objects and draw sketches right there on the website while sending notes to the recipients without depending upon any another program. Just as you get Windows 10, Edge too got the features that give out a built-in support for Cortana which is the Microsoft's voice-driven digital assistant, which enables you to surf the Web with all possible voice commands that can help you perform multitasking more efficiently than before. Edge has included a design that is based on minimalist approach and also a "baked-in" reading mode, in which you can go on saving your favourite articles or the Web pages for further references, through all the Windows 10 devices and you can even go with it offline. The new feature that attracts quite a number of users is called "inking," which is an easier method to mark, type right there on a browser page and instantly share them with the people you need to. You are free to choose the format like the size, width, colour of the messages, scribble them down or just draw around them all those items which you were longing to include and highlight them with your mouse or finger. 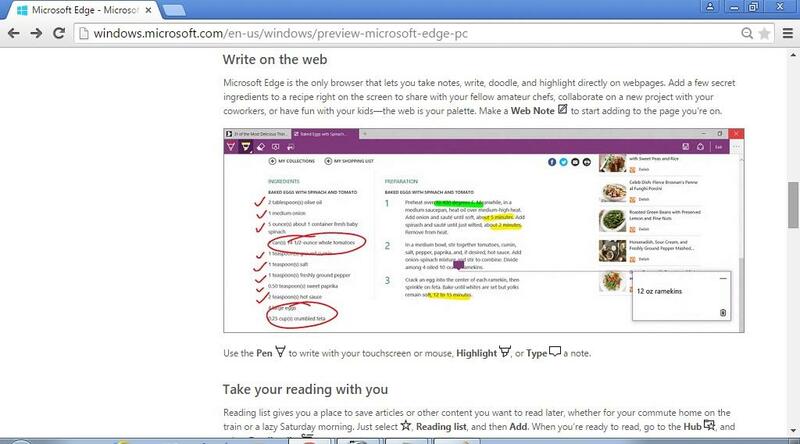 The Web Note Button that you find newly embedded on the taskbar has made drawing possible directly on the Web pages while annotating them with the relevant texts and sharing it through email or OneNote. All you have to do is to Press the Web note button and you find the entire page reloading, which may not be really convenient if you have scrolled to a particular point where you wanted to insert the annotations. Sometimes longer pages are getting cut short which at times puts you into real trouble while working towards a deadline. With the Internet Explorer kept in the background, Microsoft has clearly made it clear that this is an attempt to compete with the two buzzing browsers that are well known for their reliability and productivity. So it has incorporated the features to provide browser extensions from both Chrome and Firefox as of now. Supports browser extensions from Google Chrome and Firefox. A fast Reader and Inking. It has doubled the speed of working. The New features didn't really improve functionality to any such remarkable extent. While using the Inking, it doesn't move smoothly with the mouse. Microsoft Edge has certainly geared up with advanced options, but it couldn't yet get ahead of Chrome and Firefox, wherever popularity, reliability and ease of use are the issues. At the same time, we can give it a chance as we gave these two browsers sneaking into our system when we all were well versed with Internet Explorer. 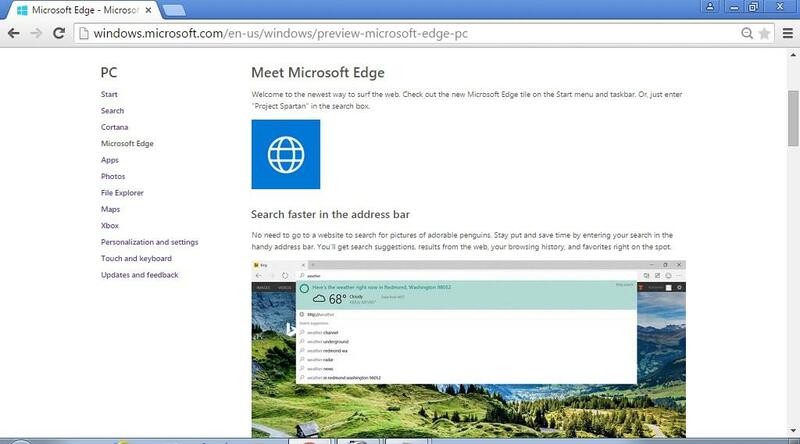 Read What is New in Microsoft Edge Browser?